Elektra is a kunoichi – female ninja assassin – of Greek descent. She wields a pair of bladed sai as her trademark weapon. 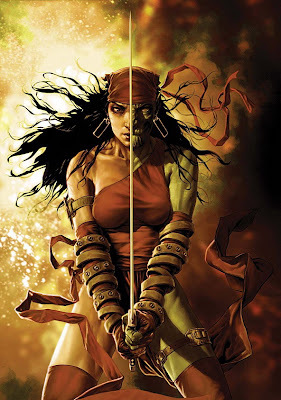 Created by Frank Miller, Elektra first appeared in Daredevil (January 1981). She is a love interest of the superhero Daredevil, but her violent nature and mercenary lifestyle divide the two. She is one of Frank Miller's best-loved creations, and subsequent writers' use of her is controversial as Marvel had originally promised to not resurrect the character without Miller's permission. She has also appeared as a supporting character of the X-Men's Wolverine and in other series and mini-series as well as adaptations for the screen. In the 2003 film Daredevil and its 2005 spinoff, Elektra, the character is portrayed by Jennifer Garner. Elektra was ranked 22nd in Comics Buyer's Guide's 100 Sexiest Women in Comics list. Miller initially based the character's appearance on Lisa Lyon, a female bodybuilder...More about Elektra Character Review...keep reading !! Skills - Elektra's primary abilities are a strong knowledge of martial arts and weaponry. 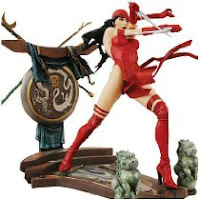 Elektra learned ancient martial arts of China, Siam, and Japan. She is a master combatant with the Japanese Sai, her usual weapon of choice. She is also highly skilled with the katana, daggers, three-sectional staff, and shurikens. She is a master of many Japanese combat forms including Ninjutsu. Elektra is an Olympic-level athlete, strong in gymnastics and swimming, with a high level in athleticism in human strength, speed, stamina, agility, dexterity, reflexes & reactions, coordination, balance, and endurance. She is resistant to pain and extreme heat and cold. She is also able to keep to the shadows and move with such speed that she can remain unseen even in daylight. Elektra has the ability to mesmerize others, and as such make them see illusions or other phenomena. Elektra also has the ability to "throw" her mind into those of others. For instance, she was able to track down her enemy, Ken Wind, by temporarily "borrowing" people's minds and acting through them while she hunted around for her prey. This temporal mind control enables her to metaphorically sniff out the psyche, or intent, of her targets. 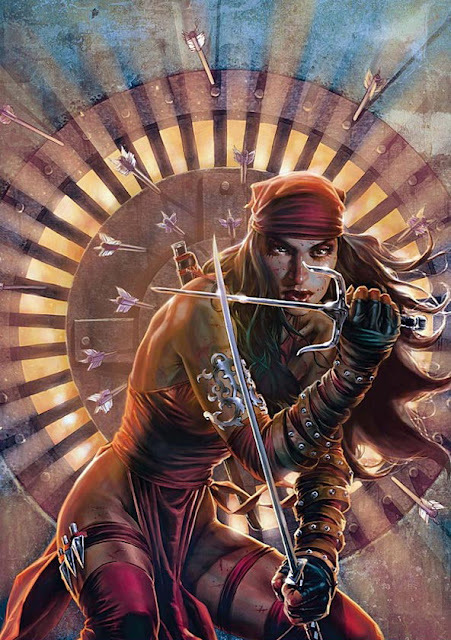 It saw extensive use during Elektra: Assassin, in which she was heavily reliant on only her ninja powers. The 2003 Daredevil film tells of Elektra being the daughter of billionaire Nikolas Natchios and the love interest of Matt Murdock. At a very young age she witnessed the murder of her mother, and since then her father has had her become highly trained in martial arts. For the role of Elektra, many actresses were looked into with considerations including Penélope Cruz, Salma Hayek, Natalie Portman, Lucy Liu, Jessica Alba, and Katie Holmes. A short-list was eventually made, giving the choices of Jennifer Garner, Jolene Blalock, Mía Maestro and Rhona Mitra, with Garner finally becoming the actress to land the role. Garner said of the character, "I think she's strong and cool and beautiful and smart. She'd be a good role model." Garner noted that the costume would be different as Elektra often wears red satin, but in the film she wears black leather. Garner explained "the red would never have worked for hiding a harness, and I know this sounds ridiculous, but you have to protect your skin a little bit. They throw me around so much on the rooftop [that] I got cut through the leather, so imagine if I hadn't had anything." The course of events in the film begin with Elektra falling for Murdock, then seeing her father murdered by Bullseye. However, she wrongfully accuses Daredevil for his death, seeing only him at the scene of the crime. Elektra was trained by Stick as a child so she practiced intensely with her favorite weapons, sai, which she would use to attack Daredevil. When she finally confronts the vigilante, she impales him by his shoulder. She goes on to unmask him, surprised to see Matt Murdock. Elektra finally realizes it was Bullseye who murdered her father. She confronts Bullseye who beats her in battle, leaving her for dead. She was able to say goodbye to Murdock before dying in his arms. In the Elektra spinoff sequel to Daredevil, it was revealed that after Elektra died, her old trainer Stick resurrected her and trained her in martial arts in the Way of Kimagure (the ability to control time, the future, and life and death), a benevolent dichotomy of The Hand. On expulsion from Stick's school – a life lesson for her heart of anger and hate – Elektra became an assassin for hire. She soon became acquainted with a single father and his daughter, Abby. She discovered the two were being hunted down by the organization known as the Hand. Elektra, with the help of Stick and his assistants, protected Abby and her father. Having been a treasure herself, Elektra was later told that Abby was to be the next Treasure: a powerful weapon that could tip the scales of the Hand's power. Elektra had a final showdown with the leader of the Hand. If Elektra won, Abby would go free; if the leader of The Hand won, then Abby would belong to the Hand. In the battle, Elektra was nearly beaten – then, realizing that The Hand leader was her mother's killer, Elektra fatally impaled him through the heart with one of her sai, and flipped him down a well where he disintegrated. A final scene shows Elektra resurrecting Abby the same way Stick resurrected her.